Jarco Roofing & Solar is one of the Southern California's best roofing companies for shingle roof repair, maintenance, new installation, and replacement. 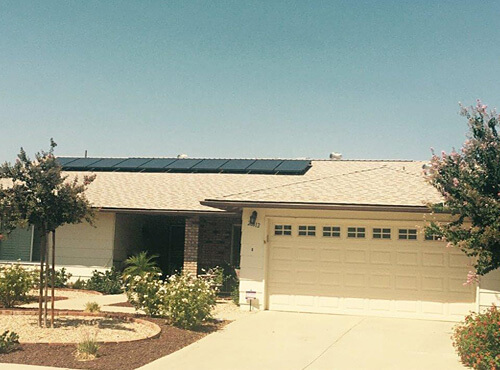 We have worked with thousands of homeowners and businesses throughout Canyon Lake and Temecula to ensure that their roofs look great and function optimally. We comply with today's Title 24 requirements and all local building codes, and work according to the best practices set by the National Roofing Contractors Association. Composition shingle roofs are a popular choice for new and replacement roofs because they look beautiful, weigh less than most other roofing options, and can cost significantly less than other roofing systems. They also require minimal maintenance and are fire resistant. At Jarco Roofing & Solar, we're authorized installers for GAF, Owens Corning, CertainTeed, Malarkey, and IKO. These manufacturers offer a wide range of colors, styles, and options, and provide some of the strongest warranty coverage available on the market today. For existing shingle roofs, we can providing roof cleaning, tune-ups and general maintenance, inspections, and certifications. Our certifications are available for one, two, and three years, and essentially guarantee it against leaks and water damage for that period of time. We're also highly experienced in composition shingle roof repairs. This includes repairing everything from weather damage to drainage issues to missing shingles. No matter the size of the job, we always provide expert workmanship and use quality materials for attractive and long-lasting results. Call Jarco Roofing & Solar today for all of your shingle roofing needs. We are a locally owned and fully licensed business that has served the Southern California since 1987. Our office is near Lake Elsinore in Perris, California, and we're open from 7-4, Monday-Friday. We provide free job estimates anywhere in Canyon Lake, Menifee, Corona, Temecula, and surrounding cities. Call us today to schedule an appointment.